US Open winner and Olympic gold medalist, Andy Murray completed what has been his most comfortable ever progression to a Grand Slam semi final when he nonchalantly brushed aside Jeremy Chardy. The twenty five years old Scot kept up his record of not having dropped a set this year with a 6-4 6-1 6-2 victory in one hour and 51 minutes on Rod Laver Arena. 'Today was the best I have played (in the tournament),' the British No 1 said. 'I struggled in the last few rounds a little bit and my last opponent (Gilles Simon) was struggling physically so it wasn't much of a match. As for tonight's remaining semi-final, Murray revealed he would only give it brief consideration. Against Chardy Murray produced his best form of the tournament, although his play has been hard to gauge due to opponents being either modest or exhausted. Chardy's big serve and forehand combination is the type that has seen off Murray in the past at Majors - such as here against Tsonga and Fernando Verdasco in 08 and 09 - but he is far less vulnerable now. 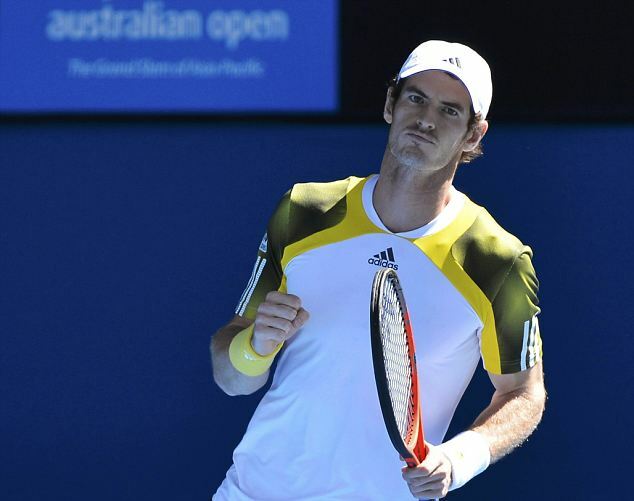 The strapping world No 36 presented him with a break in the very first game by netting a simple backhand volley, and soon Murray raced away to 4-0. Then came the only seriously competitive phase as the Frenchman found his range and pulled back to 4-3, finding the flair to give the Scot anxious moments as he tried to serve it out. Once a netted forehand return had completed the set it quickly became one way traffic as Murray moved through the gears, some of his defensive scrambling breaking Chardy's heart. Third seed Murray,will face the winner of the night session match between Roger Federer and Jo-Wilfried Tsonga in the last four.